BILLUND, Denmark, Jan. 30, 2014 -- The LEGO Group today announced that its latest quarterly review of LEGO® CUUSOO consumer inspiration platform has designated that a LEGO Ghostbusters ECTO-1 will be produced for sale under a licensing agreement from Sony Pictures Consumer Products. The item is the sixth user-designed and submitted product to be manufactured from the LEGO CUUSOO platform after receiving the requisite 10,000 fan votes to be considered for production. Made famous by the 1984 Ghostbusters film, the ECTO-1 was selected for production due to its broad worldwide appeal and the fact that the iconic model lends itself to challenging and creative building for both children and adult fans. The LEGO replica of ECTO-1 will include minifigures. The model is still in the final design stages and availability and pricing will be announced at a later date. January 30, 2014 - Listed below are the toy (and child-related) recalls from this week; these links go to the official announcements on the Consumer Product Safety Commission web site. 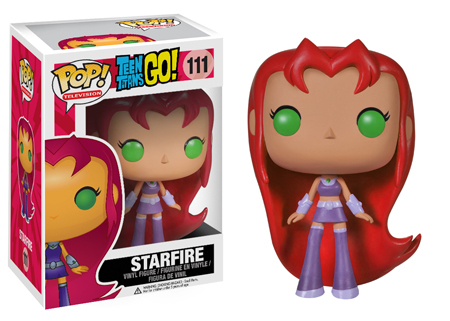 January 2014 - Toypocalypse 4: FanEXtasy is coming! 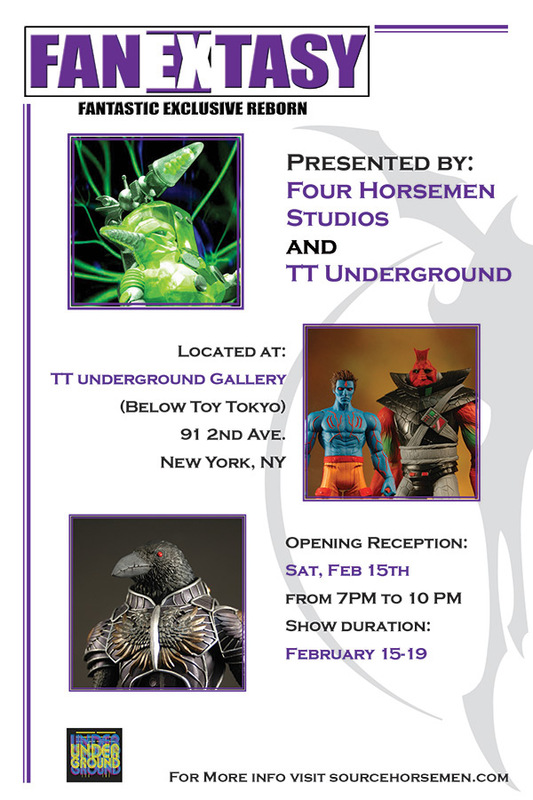 Hosted by TT Underground Gallery in New York City, the Four Horsemen's fourth annual gallery show is expected to be bigger than ever! - Be amongst the first to see the next Infinity Edition Outer Space Men factory created paint samples in person! - Be amongst the first to see the first factory created paint samples of the Power Lords characters Adam Power, Lord Power & Ggripptogg in person! - Be amongst the lucky few to see pre-production tooling samples of the Four Horsemen's Gothitropolis Ravens figures in person! - Get a look at an overview of some of the coolest Masters of the Universe figures created by the Four Horsemen for Mattel! - See in person lots of other artwork and prototypes created by Four Horsemen Toy Design Studios! - Special one of a kind items for sale! January 2014 - New York - The New York International Toy Fair is the world's largest and most important industry-only toy show. 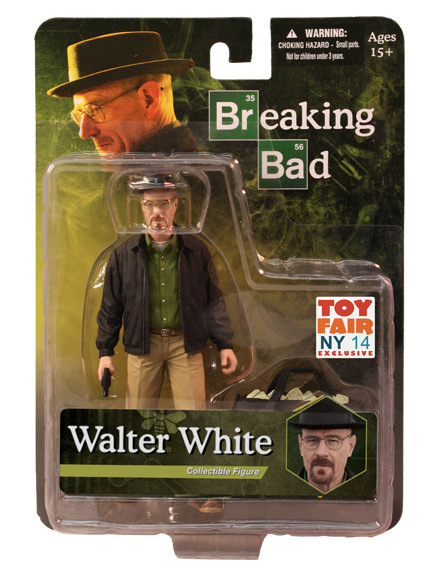 "Toy Fair Only" collectible items are a proud tradition and Mezco Toyz continues this custom with the introduction of their Walter White Limited Edition Figure. This unforgettable figure features Walter Walter with his khaki pants and green shirt as seen in several of the series' most memorable episodes. He comes complete with removable hat, removable glasses, a sack of cash, and a bag of blue crystals. January 2014 - New York - The New York International Toy Fair is the world's largest and most important industry only toy show. Closed to the public, this is where the world's toy companies reveal their product lines for the upcoming year. "Toy Fair Only" collectible items are a proud tradition and Mezco Toyz continues this custom with the introduction of their Toy Fair Sons Of Anarchy Limited Edition Coin. This 1.5inch sized metal coin features the infamous Sons Of Anarchy reaper logo in a mirror finish with a midnight black background. 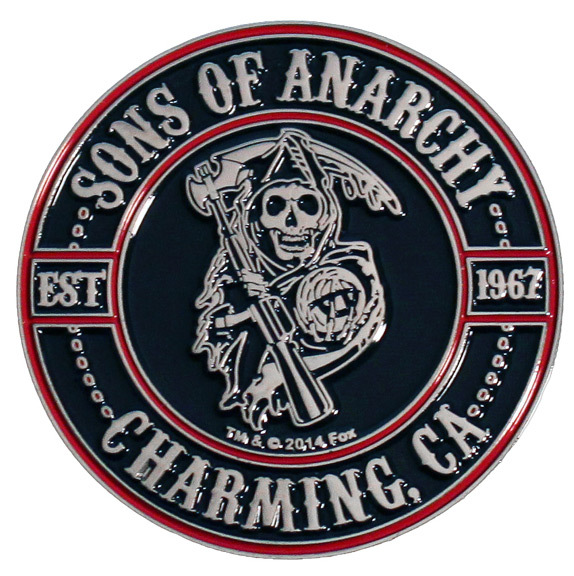 Crafted by skilled coin artisans, this is the first time a Sons Of Anarchy collectible coin has ever been offered to Toy Fair attendees. Mezco will be offering the coins to guests of the Mezco Toyz booth (#4931) as well as attendees of the special invitation only Sons Of Anarchy Product Reveal happening on February 5th. 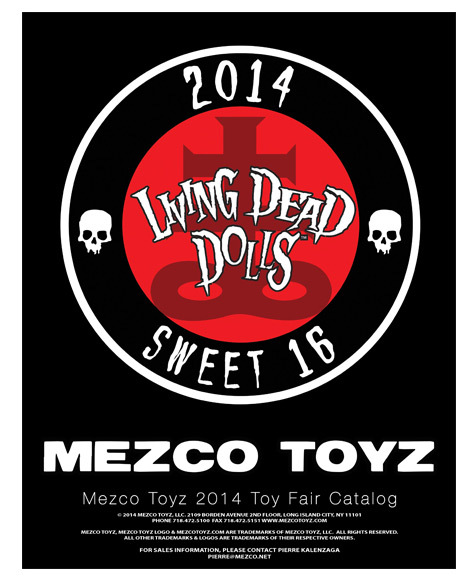 January 2014 - Generally only available to Toy Fair attendees, Mezco is now making a limited number of Toy Fair catalogs available to the general public. This catalog was created for distribution at the 2014 New York International Toy Fair and will ship after 2/15/2014. This catalog is not sold in stores and is exclusive to Mezco Direct. The first of two new Deluxe Generations assortments includes Arcee and Chromia. These two lovely ladybots are available at $31.99 for the Set of 2; they are also available in the Case Assortment - three each of Arcee and Chromia and one each of Scoop and Waspinator - for $114.99. Green Brook, NJ, January 27, 2014 - Pretty Ugly, LLC™, owner of the UGLYDOLL® grants license to Howard Keys to produce keys, key chains and lanyards in North America, Canada and selected International Territories. "The key to success is introducing a practical and comical way to avoid misplacing your house keys. So, we're introducing hilarious character branded keys and lanyards," said Alita Friedman, Chief Operating Officer. 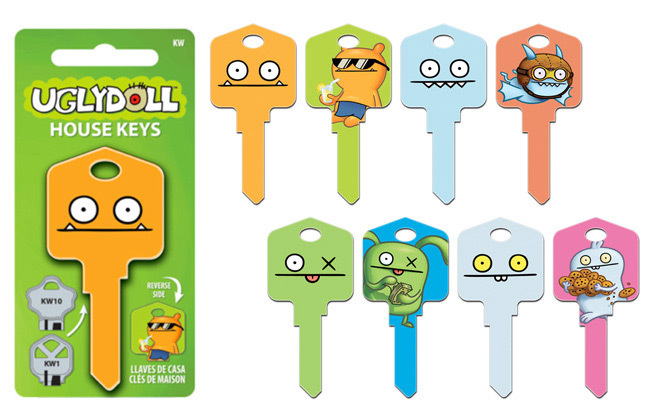 Howard Keys Owner and CEO Howard Goldberg states, "We are excited about adding Uglydoll keys to our lineup and look forward to introducing to the marketplace a highly unique and creative line of keys." Howard Keys is the #1 supplier of printed keys for the North American market including keys from Disney, Hello Kitty, Lucasfilm Star Wars, Betty Boop, Elvis Presley, Garfield and others. POP! 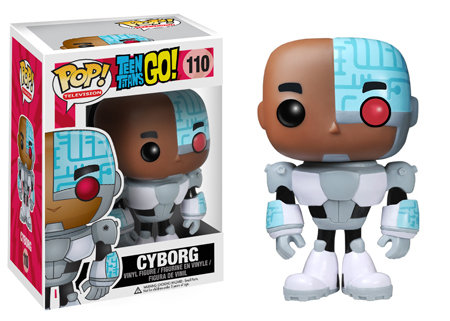 Vinyl: Teen Titans Go! 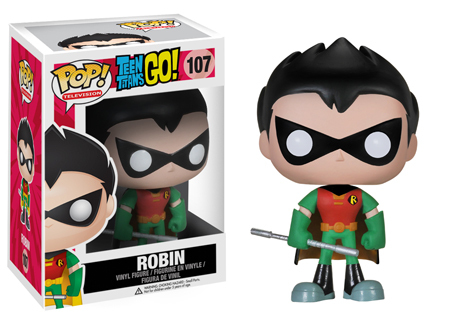 January 2014 - Funko has announced a series of POP! 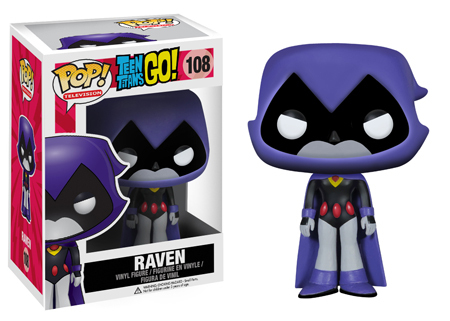 Television vinyl figures based on Teen Titans Go! 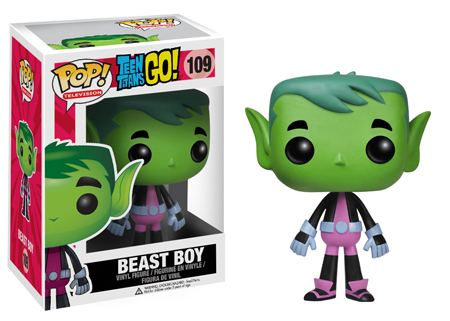 Expect to see Raven, Starfire, Beast Boy, Robin, and Cyborg in stores soon.